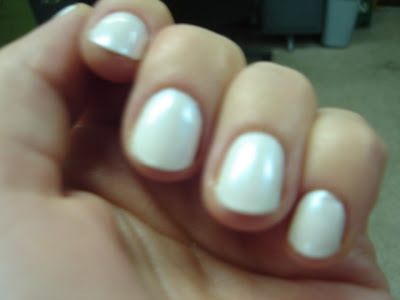 short & sweet ( and perpetually polished): White out! I saw the new display of sally hansen insta dri polishes yesterday, and the only one that jumped out at me was the white one, whirlwind white. 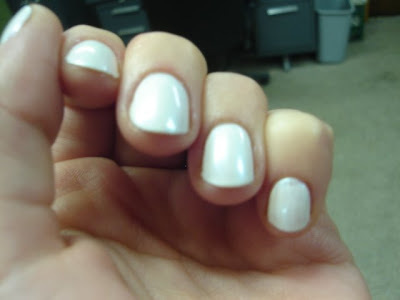 I'm always trying to find a white polish that looks creamy and non-streaky. I applied one coat of this polish and it does cover pretty well in one coat. Then to keep it from looking too much like a grade school white out manicure I topped it off with one coat of sally hansen beyond perfect in white dove. The pics don't do this justice, I tried to capture the holo of it, in real life it has faint shimmers of pink and green, but not so much that it changes the color of the white underneath.